Supporters of the ruling Georgian Dream party take part in a rally in Tbilisi, 8 October. (c) Sergei Grits / AP / Press Association Images. All rights reserved.Turnout decided Georgia’s latest election, held on 8 October. More so than usual, this parliamentary election was decided by who came to vote. Little more than 25% of the population has given the incumbent Georgian Dream a massive majority in the parliament. A ruling party that has not collapsed on itself will typically have 20% of the country’s voters firmly booked, those in good part representing the people and families that all things considered would like to keep their jobs under the incumbent government. 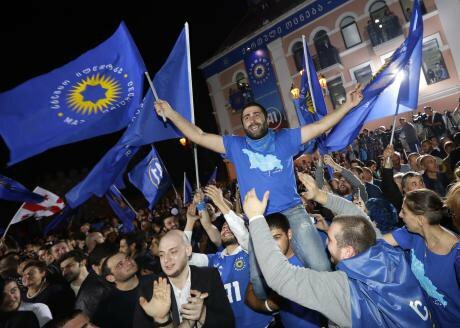 The result of the popular vote is not a resounding public endorsement but most likely it’s a sufficient mandate for Prime Minister Giorgi Kvirikashvili in the eyes of Bidzina Ivanishvili. It thus suggests that we will get more of what we have seen over the last few months. On balance, this is something that apparently many Georgians and Georgia’s partners can live with, with varying degrees of enthusiasm. Yet the Georgian Dream will have its work cut out as it has to lead the country through some tough adjustments in the next years, including a reduction in social spending (the health insurance scheme is largely seen as unsustainable), and possible further pressure on the Georgian Lari. Still, the Georgian Dream starts that hard journey with a comfortable parliamentary majority. The United National Movement (UNM) ran a great campaign in reaching out to individual voters, and going door-to-door. The results still fell short of expectations, for one external and three internal reasons. Externally, the party is under pressure. Some of the UNM leaders remain in jail. Party activists faced various levels of harassment across the country. It seems plausible that key party figures (Zurab Japaridze, Giorgi Vashadze, to mention some) were lured to defect by a combination of incentives. The State Security Service remains more active than it should be. This not-so-pretty part of the election environment often gets glossed over by Western analysts that have found it difficult to hide their long-running personal dislike for the UNM. That said, there also are three internal reasons why the UNM fell short. Too much of the UNM party rhetoric still conveys anger. The acrimonious style turns off potential voters who worry what will happen when angry people are in charge, and what happens when they get so angry that they turn vicious. The raging tone remains a particular problem for Saakashvili, but also for several other party figures, and for Rustavi 2. If it wants better results, the UNM does need to learn supreme discipline, in going and staying positive, even when goaded. The party has improved significantly, throughout 2016, but not sufficiently. 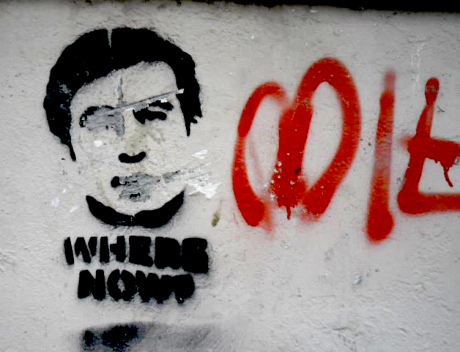 Where now for Mikheil Saakashvili? Despite suggesting a triumphant return across the Black Sea, it seems that Georgia’s former president is destined to remain in Odessa. Photo: Maxim Edwards, TbilisiThe UNM overall leaned in too much by projecting victory, in the last stages of the campaign. This again worried some potential voters, for reasons of anger management. It also made other potential voters complacent, as a respectable result for the UNM seemed assured. Technically, the party should have consistently framed the election as an ambitious reach target, saying that they still needed as much support as possible, every vote matters, for a strong showing, to play a strong constructive role in Georgia, rather than setting the mark at victory. This may have mobilised voters that ended up staying home. After the successful renewal of the UNM party list, Saakashvili misstepped by reframing the elections as a referendum on his return. This redefinition, in the last two weeks, obscured the hard work of the entire party. It sidelined the new team that had spent months campaigning door-to-door, essentially recasting them as accessories to Saakashvili personal journey. Saakashvili rightly recognized that he remained important to many voters, as the getting-things-done guy. However, he should have presented himself as an enabler of the team rather than the returning saviour. In the very last days, the UNM appear to have realised this, as party leader Giga Bokeria valiantly pointed out that Saakashvili could not become Prime Minister, since he was not a Georgian citizen, and that the team had much internal capacity. Similarly, Saakashvili just before the election, and on election day itself, backtracked on the promise of return. It was too late. Many voters may have liked to vote fresh faces of the UNM into prominent roles — but were less attracted to a referendum on bringing Misha, unreconstructed, right back in. Here is a silver lining that may be worth steering towards. A sober analysis in the Georgian Dream may well come to the conclusion that it will be an uphill struggle to win the next parliamentary election. Comfortable as they will be in parliament, nearly three quarters of the population did not vote for them. They pulled out most of the stops, including investing money into Georgian Dream Studios, which must be haemorrhaging a midsize yacht or two of money every month. Bidzina Ivanishvili is unlikely to transform himself into more popularity, as he’s at best an awkward introvert with quirky views that will remain alien to the lives of average voters. Painting every day betwen November 2003 and October 2012 as a horror was already old this summer, and is unlikely to work at all next time around. After their celebrations are over, Georgian Dream leaders will realise that the absence of viable third parties makes their own room of manoeuvre tighter, and that bludgeoning your only parliamentary minority is fraught with risk. In an optimistic scenario, the Georgian Dream may thus realise that they should govern in ways that allow them to lose the next election. Conversely, the UNM could define their result as a success, rather than as a defeat. (In the same way in which the UNM in a magic sleight of hand defined having survived Vladimir Putin’s onslaught as victory in 2008, in spite of Russians driving tanks across large parts of Georgia, ransacking barracks in Gori, sinking ships in Poti, and much more.) They are there for the next round. There are no credible competitors. The overwhelming lesson is that starting an alternative to the UNM is a fast road to political oblivion and potential ridicule, whatever your diplomatic, political or operatic talents. The UNM thus has a strong upside in taking the long view, talking to voters, and mobilising support. In that context the UNM’s future does not need to be about “ditching Misha”, as some commentators will be quick to suggest. Parties are not fantasy football teams, in which you combine Lionel Messi with Pelé and Franz Beckenbauer. Yet the UNM will need to define the relationship in ways that are compelling to voters. It has time to do so. The UNM will be lucky if it can retain Giga Bokeria, who did incredibly well in holding the UNM together over the last years, as the key figure in this process. My social media feed on this post-election morning has mostly been filled with gloom, about the disappearance of third parties, about a potential super majority, about the Alliance of Patriots, about the eventual developments. There are indeed ways in which things could go wrong. Yet that has always been so, and Georgia is not now set on some fixed downward path. From the elections, there are some powerful lessons about the perils of lethargy, and about the need for political discourse to become more practical and less dismissive. There should be a reckoning, in which all sides ask themselves how they contributed to where we are. Many of the lessons are not just for the politicians but applicable more broadly to Georgia’s elite, and Georgia’s foreign friends. 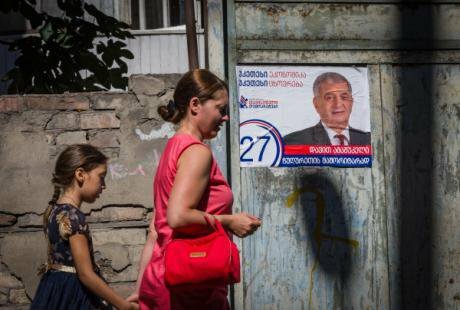 Two Tbilisi residents walk past an electoral poster for Irakli Alasania’s Free Democrats. (c) RIA Novosti / Levan Avlabreli. All rights reserved.Part of that reckoning, as described above, could be the insight, painful for both main parties, that they are the only ones left on the ship that they will have to captain through Georgia’s choppy geopolitical and economic waters. Once you acknowledge that your nemesis won’t leave board, and is likely to take over the steering wheel after an ocean or two, it may be worth considering redefining the enemy as a political competitor. I can already hear the exasperated objections from my Georgian friends across the political spectrum about how impossibly naïve this idea is. Yet it’s this transformation that put many established democracies on their course, and it likely would best serve the parties, and the country. It’s not about pretending to be friends. That won’t happen. But it’s about learning how to pick the right battles, avoid needless escalation, and practice de-escalation where possible — and that more than anything it’s about reassuring people that you are taking them in the right direction. That we are only left with two main parties provides a powerful clarification, to the parties, and to Georgia as a whole. It makes clear that we need to shift and evolve political culture, and make the practical adjustments that are needed, across a range of sectors and issues, to make do with the crew that there is. This realisation could be a step forward for Georgian democracy. This article was originally published on the author’s blog. We are very grateful for his permission to reproduce it here.